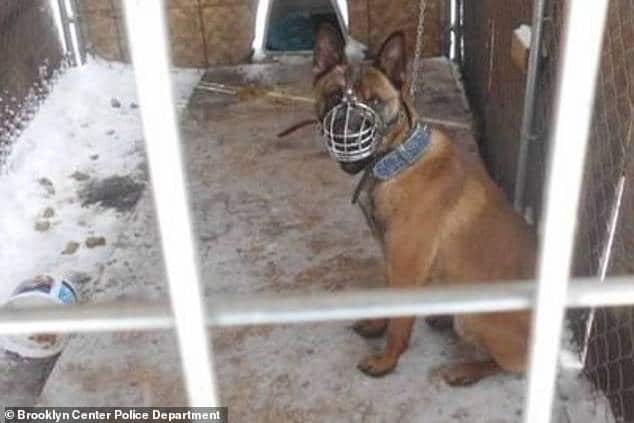 Pictured the pet dog that Dang Xiong allegedly left outside of his Brooklyn Center, Minnesota, home on Tuesday afternoon as temperatures dipped to -9F. Dang Xiong: A Minneapolis, Minnesota dog owner is charged with animal cruelty after his leaving his pet dog chained in sub polar cold temperatures. A Minneapolis, Minnesota dog owner has been charged with animal cruelty after his pet was found chained outside during sub-polar cold temperatures sweeping the Midwest. Dang Xiong, 29 was cited for the misdemeanor after leaving his dog outside of his Brooklyn Center, Minnesota, home on Tuesday afternoon when temperatures dropped to -9F, according to KMSP-TV. The canine was found on a short chain outside by police officers who said they also found vomit nearby and very little food and water inside the exposed shelter. Xiong was hit with a citation for inhumanely, unnecessarily, cruelly beating, injuring or abusing an animal. The fine can bring a penalty of up to $1,000 in the state of Minnesota. Not immediately understood is what compelled the man to mistreat the animal with wanton disregard. Authorities seized the dog taking it to the Pets Under Police Scrutiny (PUPS) center in Maple Grove, Minnesota, the pet impound facility for several towns in the area, according to Bring Me the News. Xiong left his dog outside during the polar vortex gripping a large swath of the United States with temperatures ranging from the teens to below zero. The deadly weather phenomenon has killed at least 13 people since Tuesday, including a pre med student who was frozen alive– with weather plunging to as low as -24F in Minneapolis alone.